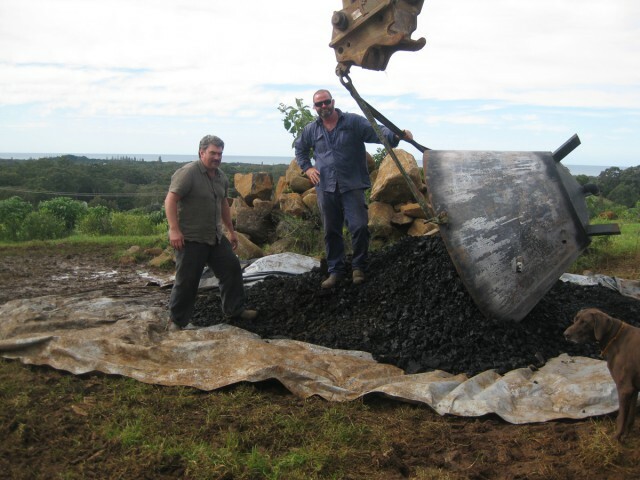 Brunswick Heads organic farmer Kelvin Daly is all fired up about a new method of biochar production and a new way of enriching the soil on his property and his cattle’s health. He’s eager to spread it and the word around, and so is local horticulturist and biochar consultant Don Coyne, who helped Kelvin set up a farm-size biochar kiln on his property recently which produced lots of the loamy peat clumps of biochar to give the cows to eat in their food, and not just spread into his garden soils. It’s been found that dung beetles which feed on cow’s droppings containing activated charcoal from the biochar, take the biochar further into the soil, thereby boosting its growing power and productive value. 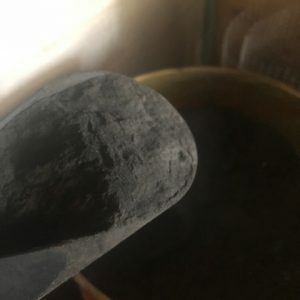 It’s a truly sustainably way by which Kelvin was able to clean up his property of old fence posts, offcuts and other burnable building waste and convert it to the biodynamic charcoal (or biochar) by a simple low-cook method. 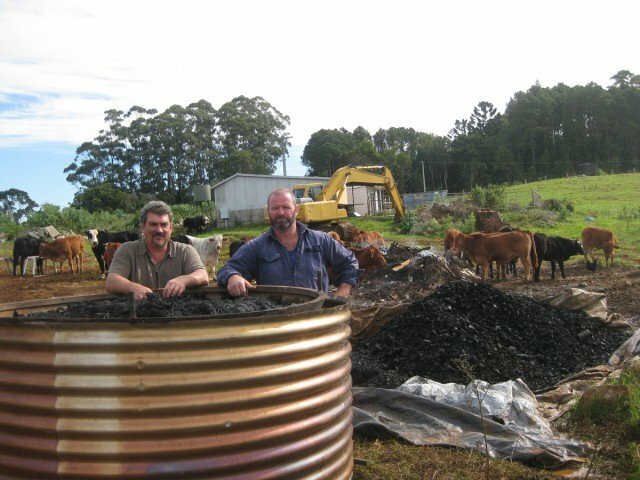 They both enthuse: ’it’s the ‘black gold’ of farming, it’s a ‘breakthrough’ and ‘game changer’, and urge farmers, graziers and anyone interested in organic horticulture or gardening to attend the upcoming Byron Bioenergy Conference at Byron Eco Park, Tyagarah, on the weekend of September 12-13. 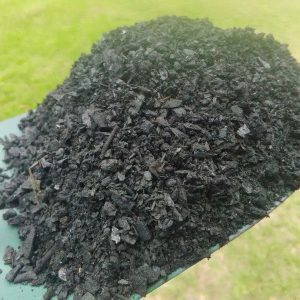 The two say large-scale biochar production is taking off in Europe where soils depleted by over-use have been replenished using biochar and pastures where cattle are fed with it and grazing through orchards have improved as a result. One of the keynote speakers at the conference is an avocado, dairy and beef farmer from Western Australia, Doug Pow, who has been feeding his cows biochar for four years and seen economic and biological outcomes far beyond his expectations. Kelvin, who does not use sprays or chemicals on his herd, says catle farming and agriculture on the north coast would benefit from use of biochar. 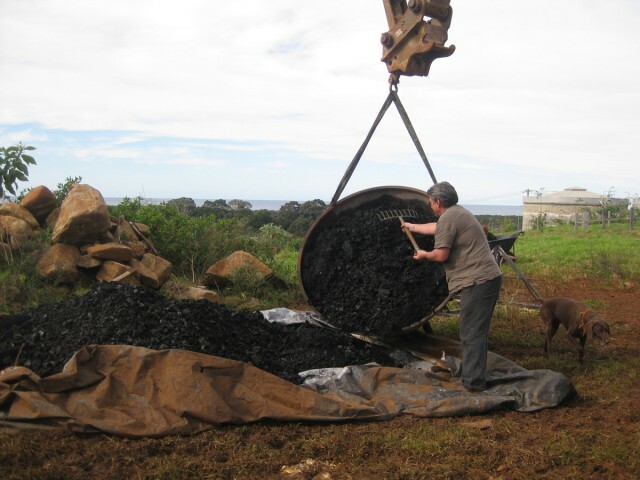 He and Don managed to prouduce a healthy large pile of the finished biochar from several tonnes of wood scrap and says it’s a fairly simple kiln set up. He admitted the collection, chainsawing, splitting, iling and turning the wood pile was a little labour intensive at first, but worth it when one sees the lush end product, a whole five-tonne pile of the valuable material. Kelvin said the new way of spreading biochar by dung beetles feeding on the cow droppings was what also made the use of the soil-reviver hugely more economically viable for orchardists, and there was plenty of those on the north coast. 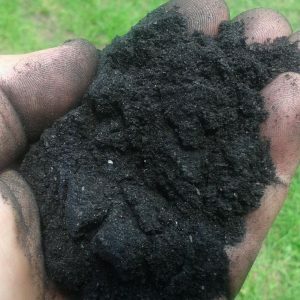 No more spreading tonnes of expensive fertilisers per acre, he said, the dung beetles can ‘get in there and just do their work’ on the droppings of biochar-fed cows. 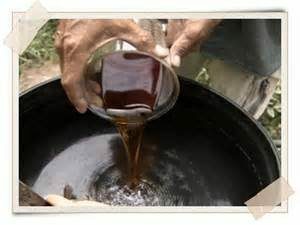 He said macadamia farmers in the region could also benefit greatly as they would have a new use for husks to add to their kiln or generate electricity. Other speakers at the conference include: Bob Doyle (the largest grower of industrial hemp in Australia who has just bought the Old Timber Mill at Dungog to make hemp pallets), Kaye Wood from Byron Bay Bamboo, Euan Beaumont from Energy Farmers Australia, Dr Joe Herbertson (award-winning engineer of the ‘Continuous Biomass Converter’), soil scientist Dr Lukas Van Zweiten (from NSW Department of Primary Industries), Dr Stephen Joseph (visiting professor, who will demonstrate the revolutionary Kontiki Kiln) and Chad Sheppeard (director of Wood Vinegar Australia, which produces a biochar water product).